I see you now get the Jetstream trailer in South Africa well even made in South Africa. Ideal for you and your partner to have fun times together. Most of my childhood I have visited these parts of South Africa. We have had some close calls with hippo and crocodile. I did write a piece about it on my fishing encounters blog. This is a very sad video but it is something we need to be aware of. Africa is a wild place and we live close to some very dangerous creatures. My uncle had a Jack Russel puppy that I would play with. It used to come to our house and then go back to my uncle’s house. We stayed on the farm. One day the puppy just disappeared. The only thing we could think of was that it was taken by a African crowned eagle. I have a big affection for dogs so in seeing this video of the dog getting taken out by a crocodile has been a huge shock to my system. So I think keep your eyes open and even if you think something won’t happen to you, rather not make it true. Adopt a penguin for your Valentine! Penguins mate for life and are a universal symbol of true and lasting love. But even penguins could use a little extra love. In South Africa, less than 2% of the endangered African penguin population remains in the wild. This Valentine’s month, you can adopt two penguins for the price of one from SANCCOB (the Southern African Foundation for the Conservation of Coastal Birds) and help to save African penguins from extinction. For only ZAR600 (US$37/€34), you can say ‘I love you’ to that someone special by naming and adopting two penguins rehabilitated at SANCCOB. You will receive two adoptions packs including pictures of the two adopted penguins, certificates of adoption and other penguin goodies. Alternatively, if couple names are your thing, you can choose our new ‘Name your penguin couple’ adoption, come up with your unique couple name and receive a special adoption pack including two fluffy penguin keyrings for you and your sweetheart for ZAR750 (US$47/€43). Think Brangelina, Bennifer or Kimye. In mid-October I returned to South Africa. It was an unexpected trip at short notice, but I was so excited to be returning to, what is without a doubt, my favourite country for wildlife photography. This was my second stay at Jaci’s Lodges in Madikwe. Jaci’s is a family owned lodge that has a very personal approach, and the hospitality is second to none. Jaci’s comprises of two lodges – the main lodge and the tree lodge. On my first stay and this subsequent trip I stayed in the tree lodge. I’ve stayed in a few different lodges in South Africa and I have to say that Jaci’s tree lodge is probably my favourite. The rooms are incredible – they are luxurious and have a bathroom and outdoor shower to die for. Coming from northern Europe where we just don’t get the heat to have outdoor showers, it was a revelation. The lodge is built on stilts and there are walkway passages amongst the trees between the rooms and the main lodge area. This gives you a real feeling of being in the African bush, and there are some interesting animals to be seen within the lodge itself. Most notably, bushbuck, banded mongoose and vervet monkeys. But that’s about where it starts and ends in terms of wildlife within the lodge as Jaci’s is fenced. This makes it ideal forfamilies. It means that parents and children are free to roam; whether that be to the star bed lookout or to one of the swimming pools to relax. As Madikwe Game Reserve is also malaria-free, it is a serious contender if you are considering a family safari experience. The Minister of Environmental Affairs has announced that she has opened the Marine Protected Area (MPA) of Tsitsikamma to fishing, which has changed the protected status of the reserve. Minister Edna Molewa initially published draft regulations on the 19th November 2015 to withdraw the existing Tsitsikamma Marine Protected Area, and these regulations are open to public comments for 60 days from this date. The decision follows a 20-year-old journey initiated by Tsitsikamma anglers who cited cultural, historical and subsistence reasons for requesting fishing rights in the Marine Protected Area. The Department of Environmental Affairs, SANParks, the Koukamma Municipality and other stakeholders have held various meetings with the Tsitsikamma angling forum to discuss the zonation of possible controlled areas within the MPA. The intention is to reassess the basis of marine resource use in the Tsitsikamma Marine Protected Area of the Garden Route National Park, which is currently a safe haven and breeding ground for line fish and squid. It was the first time that I’d really noticed stars. By which I mean that I truly had my gaze taken hostage, my neck snapped skywards and my mouth left unwittingly agape. As I sat clasping an icy lager around a campfire in Sossusvlei, a blizzard of stars littered the heavens like glitter; piercing the inky darkness with a savagery that I never knew possible. It was like nothing that I’d ever experienced before. Nothing I’d ever felt before. And it was about to be just one of many highlights on this epic journey through Southern and Eastern Africa. We had harboured the idea for some time: five friends, four months, 20,000 miles in a rustic Land Rover Defender; exploring societies, dodging the helter-skelter of everyday life and immersing ourselves in the vivid beauty of this eclectic continent. 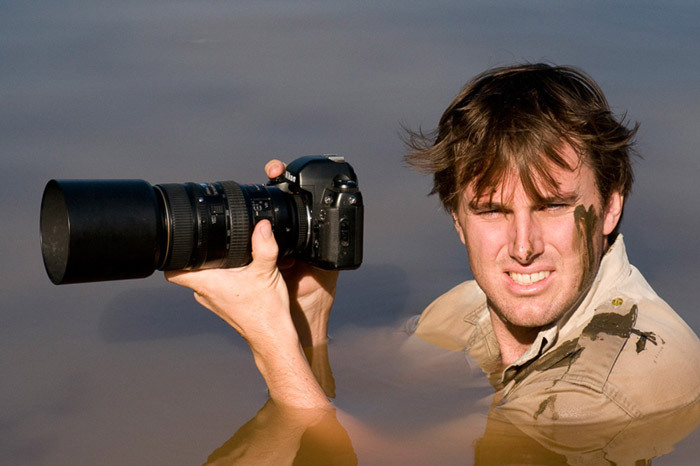 Greg du Toit is probably Africa’s best known wildlife photographer. In 2013 he won the BBC World Wildlife Photographer of the Year competition. However, this award was long overdue as Greg has been taking some of the best wildlife photographs in Africa for almost two decades. Today the 38-year-old is also one of the best photographic guides on the continent, and leads tours to some of the most beautiful protected areas in Africa. I caught up with Greg recently to ask him a few questions. Greg, which are your top three wildlife regions of Africa? I think the first one would be Mala Mala. It’s the largest part of Sabi Sands Game Reserve in South Africa, and all their infrastructure was built on less than 10% of the land. There’s nothing between you and Kruger National Park, except lowveld bush and phenomenal wildlife. For me, I think the lowveld is still the place where my heart is because that’s where I grew up. It’s where I first fell in love with the bush. I couldn’t help but think of the adage “you snooze, you lose” when I saw a hungry leopard chance upon an oblivious warthog boar that was resting at the water’s edge at the Sable Dam in Kruger National Park. When I arrived at the dam, I was informed that a leopard male had been seen over the past hour and a half but that I had just missed it. However, when I scanned the surroundings, I noticed that some impalas were still fully alert, with their ears standing up and appearing very uneasy. Chief Executive Officer of iSimangaliso Wetland Park, Andrew Zaloumis, reflects on an encounter with a buffalo late last month that left him and his wife seriously injured. “Tracey and I recently had a (too) close encounter with a buffalo while working with a small group on the eastern shores of the iSimangaliso Wetland Park. As operational park staff, we are trained and frequently required to walk in remote places, but the incident brought home a few important bush truths. The rapid response, extraordinary teamwork and collaboration between colleagues in iSimangaliso, Ezemvelo KZN Wildlife, local residents and medical personnel resulted in us being safely and swiftly attended to despite the inaccessibility of the area for vehicles. We are extremely grateful to as well as proud of everyone involved. The enormous number of messages, calls, gifts, prayers, well wishes and offers of assistance in many different ways, from community near and far, is truly appreciated.